"Some of the activities you are about to witness are extremely dangerous and should not be attempted by any one under any circumstance. Viewer discretion advised." Thre is hardly a more famous name in the wacky and weird than Ripley: the books, the newspaper columns, the museums, and, of course, the television show. 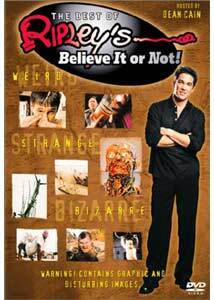 Memorable for host Jack Palance for many years, and now, actor Dean Cain, Ripley's Believe It or Not has scoured the world for oddball objects, customs, and practices to display for the entertainment of its watchers. The show stands as somewhat of a predecessor of the explosion of reality-based shows that have taken over network TV. Some other highlights that mix the weird with the slightly risqué include test "non-lethal" weapons, the skateboarding dog, the lizard man, and in a titillating tilt, the airline service that dresses its buxom flight attendants in lingerie. Skintight swim wear in Puerto Rico turns out to be painted on—body artist Filipo Loco hopes to get people to use their imagination by leaving nothing to it. Then there is the gambler who takes a bet that involves him getting breast implants. Dean Cain, best known for his run as a youthful Superman opposite Teri Hatcher's Lois Lane in the popular Lois and Clark: The New Adventures of Superman television series, who also is a producer, has held this gig as host of Ripley's Believe It or Not for four years and does a serviceable job with the often overwrought decriptive prose that passes for narration in the world of Ripley, especially the propensity for puns that proliferate. The show is very well-made, with crisp editing and great attention to detail. For fans of this kind of thing, this a gold mine. Around our house, this might be one of the last things we would watch on TV since the freak show that passes for network news is completely weird enough for us. The guy who had his face ripped off when he fell face first over the handlebars of his motorcycle does not elicit much from us, except a Gumpism like "stupid is as stupid does," which could serve as a slogan for a lot of Ripley material. Not quite the dog-faced boy, either. Image Transfer Review: Very nice and warm television transfer with excellent color and clarity. Lots of material involved from differing sources and good production work combine for excellent television viewing and DVD quality. Audio Transfer Review: As with the video, there are good production values on Ripley's Believe It or Not and they show up in the good quality Dolby 2.0 audio transfer. Mixing narration, music, and natural sound to good effect, the track keeps it all moving nicely. Extras Review: The lack of extras on this disc is quite surprising considering the wealth of material that would be available for recycling from the Ripley archives. It is difficult to say whether this is good, that in leaving them off the price point stays lower, or bad in that we could have had much more interesting material available: the classic argument of cheaper with no extras vs. more expensive with dubious extras. Here, no extras, wins... as long as the disc is under $12. After all, there's only 90 minutes of material. Not everybody's cup of tea, but if you like weird stuff, then The Best of Ripley's Believe It or Not has plenty for you. Some of it is just dumb, some is too weird to watch, and some is downright spooky in the classic Ripley tradition.